The objective of this study was to assess the diagnostic value of the bone resorption marker tartrate-resistant acid phosphatase isoform5b (TRACP 5b) in detecting bone metastases in patients with renal cell carcinoma (RCC). Serum samples of 64 patients with histologically proven RCC were analyzed. Using bone scintigraphy, these patients were divided into 2 groups: 30 patients with RCC without bone metastases and 34 patients with RCC with bone metastases. TRACP 5b concentrations were analyzed in the serum using the Bone TRAP Assay. TRACP 5b concentrations were significantly elevated (p=0.014) in patients with bone metastases (median: 31.9 U/L) compared with patients without bone metastases (median: 8.7 U/L). Elevated TRACP 5b concentrations detected bone metastases with sensitivity of 76.5% and specificity of 36.7%. TRACP 5b appears to be an effective biomarker of bone metastases in patients with RCC. Renal cell carcinoma (RCC) accounts for >90% of malignant solid lesions in the kidney. Each year, approximately 65,000 new cases and almost 14,000 deaths related to kidney cancer are documented in the United States . The peak incidence of RCC is at ages between 60 and 70 years. Risk factors are male gender, smoking, obesity, and hypertension . Over the past years, a small albeit constant increase in the incidence of RCC was observed. Various factors influencing the incidence of RCC were identified. One such factor is a change in lifestyle, particularly concerning obesity and the smoking habit. Another important factor is better diagnosis, namely, the more frequent use of high- resolution technical devices such as ultrasonography, computed tomography, and magnetic resonance imaging. Using these techniques, early-stage RCC is often detected by accident. Many of these cases are qualified for curative treatment [3,4]. The incidence of RCC shows regional differences and the range between 3 and 10 per 100,000. The 5-year survival rate of all stages of RCC is estimated between 40% and 60% [3,4]. In contrast, the 5-year survival rate of metastasized RCC is estimated to be less than 10%. Hence, to confirm or exclude metastases is essential for the prognosis of patients with RCC [2-4]. At diagnosis, approximately 20%–30% of the patients with RCC are found to have metastases. Bone is the second most common site of metastasis in patients with RCC after the lungs [2,5,6]. Concerning the treatment of RCC, it is important to distinguish between metastatic and non metastatic disease. In most cases, patients with non metastatic RCC can be operated on with a curative intention. If metastases have occurred, all available treatment options are palliative. Chemotherapy, radiation, and immunotherapy may merely prolong life expectancy to a limited extent [2,5]. Because prognosis and treatment are essentially different for metastatic and non metastatic RCC, it is necessary to have accurate diagnostic devices at hand to detect or rule out metastases of RCC. In regards to the diagnostics of bone metastases of RCC, bone scintigraphy is the gold standard [2,7]. Despite good sensitivity, bone scintigraphy lacks specificity [8,9]. Moreover, bone scintigraphy is associated with radiation exposure. A study by Ghanem et al. showed that the effective dose which is absorbed by patients undergoing a scintigraphy of the skeleton is estimated at 4 millisieverts. High costs, a considerable effort, and a burdensome procedure for the patient are the other important disadvantages of bone scintigraphy  (Figure 1 and 2). In contrast, analysis of bone formation and resorption markers offers a less invasive and relatively inexpensive procedure. In most cases, merely a venous blood sample is required for laboratory tests. In recent years, numerous bone formation and resorption markers have been analyzed for their diagnostic value in bone metastases of different tumors . One of the most interesting among the bone resorption markers is the tartrate-resistant acid phosphatase 5b (TRACP 5b). TRACP is an enzyme that can be found in different types of cells of the mononuclear phagocyte system. It possesses 2 enzymatic functions. TRACP may function as a phosphatase; on the other hand, it may produce reactive oxygen species. Two forms of TRACP have been identified in human serum: TRACP 5a and 5b. TRACP 5a is generated by macrophages and dendritic cells, which elevate serum concentrations under inflammatory conditions [11,12]. 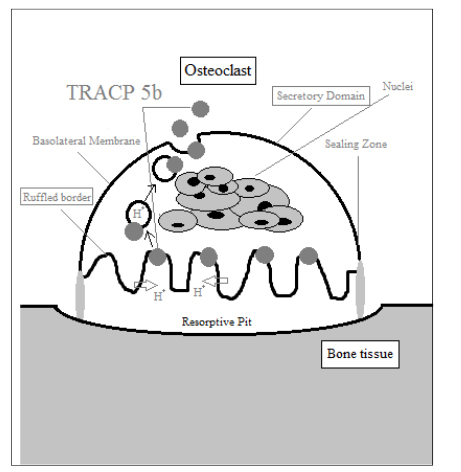 TRACP 5b is produced by osteoclasts, whose principal function is resorption of bone tissue. Because TRACP 5b appears to be produced exclusively by osteoclasts, Halleen et al. and Ylipahkala et al. claim that TRACP 5b is a specific marker of bone resorption [11,12]. Immunoassays for isoform 5b of TRACP are commercially available. Previous studies by Halleen et al. , Lyubimova et al. , Chao et al. , and Yao et al. demonstrated that bone metastases of different tumors influence bone metabolism and induce significantly elevated serum levels of TRACP 5b. With regard to bone metastases of RCC, a study by Jung et al. appears to contradict the above reports. This study shows the absence of significant differences in TRACP 5b levels in the presence or absence of bone metastases in patients with RCC. Because there appears to be a discrepancy between different studies on the diagnostic value of TRACP 5b for bone metastases in different cancers, we aimed to verify whether TRACP 5b is a useful diagnostic tool for the detection of bone metastases. Similar to Jung et al., we chose patients with RCC for this study. Hence, the objective of the present study was to test whether elevated serum concentrations of TRACP 5b reliably indicate the presence of bone metastases in patients with RCC. Our unblinded study included 64 patients with histologically confirmed RCC who were treated at the Goethe University Hospital, Frankfurt. The 64 patients were divided into 2 groups by bone scintigraphy results: The first group consisted of 30 patients with histologically proven RCC without evidence of bone metastases. In the text below, these patients will be referred as T(+) BM(−). The second group comprised the remaining 34 patients with histologically proven RCC and bone metastases. These patients will be referred to as T(+) BM(+). For all subjects, the inclusion criteria were defined as an age of >18 years and histologically proven RCC. The exclusion criteria were recent bone fractures, apparent osteoporosis, hyperparathyroidism, and therapy with bisphosphonates. Two patients had to be excluded from the study because of hyperparathyroidism. Blood samples were collected using serum tubes. Within 1hour, all samples were centrifuged at 3000 revolutions per minute for 10 minutes. The serum was subsequently stored at -80°C until analysis. The blood samples were collected between January 2006 and July 2007 at the Goethe University Hospital. TRACP 5b data were obtained using the Bone TRAP Assay (Immunodiagnostics Systems GmbH, Mainzer Landstrasse 49, 60329 Frankfurt, Germany). This assay semiquantitatively measures in vitro activity of TRACP 5b fragments in the serum. At the first step of the Bone TRAP assay, a microtiter plate coated with a monoclonal anti-mouse Immunoglobulin G antibody binds a monoclonal anti-TRACP antibody. At the second step, TRACP standards, controls, and patients’ samples are added. A release reagent then induces the dissociation of TRACP from binding proteins and the detached TRACP molecules associate with the anti-TRACP antibody immobilized on the microtiter plate. At pH 6.1 (which suppresses the TRACP 5a activity) p nitrophenylphosphate, the substrate of the Bone TRAP Assay, is added. Finally, the enzyme–substrate reaction is stopped by adding sodium hydroxide after an incubation period of 60 minutes. Spectrophotometric measurements were performed at 405nm. The median and range were determined for the groups T(+) BM() and T(+) BM(+). Sensitivity, specificity as well as positive and negative predictive values was calculated. A receiver operating curve (ROC) was plotted. All statistical calculations were performed using the SPSS 16.0 software (SPSS Statistics), Bias Windows, version 9.17 (Epsilon) and Microsoft Excel 2007. 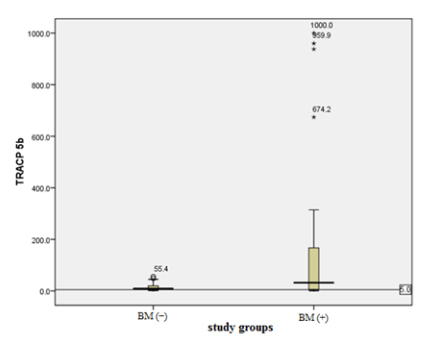 In our study, TRACP 5b serum concentrations ranged from 1.0 to 55.4 U/L in the group T(+) BM(−) and from 0.6 to 1000 U/L in the group T(+) BM(+). We found significantly (p=0.014) higher TRACP 5b levels in patients with RCC with proven bone metastases (median: 31.9 U/L) than in the control group of patients with RCC without bone involvement (median: 8.7 U/L). These results are shown in Table 1. In this study, the TRACP 5b cutoff was 5.0 U/L, according to a study conducted by Salminen et al. , who analyzed TRACP 5b as a marker of skeletal changes in patients with prostate cancer using the Bone TRAP Assay. The medians of both groups, T(+) BM(−): 8.7U/L and T(+) BM(+): 31.9U/L, were significantly above the cutoff value used in this study (5.0 U/L). The specificity was 36.7%; sensitivity reached 76.5%. We tested whether a different cutoff may be more appropriate for the diagnosis of bone metastasis in patients with RCC using TRACP 5b. 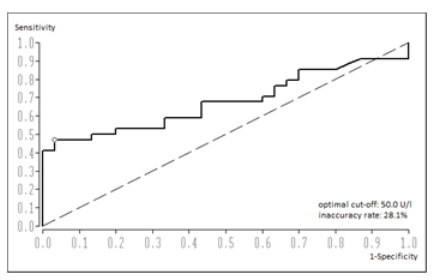 Using ROC analysis, we identified the optimal cutoff with regard to the existing values of our study at 50.0 U/L. The area under the curve (AUC) value was 0.68. The ROC curve is shown in Figure 3. We calculated sensitivity, specificity, positive and negative predictive value at the cutoff 50.0 U/L and compared the diagnostic value of TRACP 5b at the cutoff values 5.0 U/L and 50.0 U/L. The quality parameters for the cutoff values 5.0 U/L and 50.0 U/L are displayed in Table 2. At present, the diagnostic standard to detect bone metastases in patients with RCC is the bone scintigraphy [2,7]. Despite high sensitivity, the bone scintigraphy lacks specificity. Further disadvantages of the bone scintigraphy are high costs, labor intensiveness, and radiation exposure. Other diagnostic devices used to identify bone metastases are conventional X-ray, magnetic resonance imaging, computed tomography, and positron emission tomography/computed tomography. Except for the conventional X-ray imaging, all these tests require a great deal of labor. Moreover, they are cost-intensive and time-consuming [7-9]. Of particular interest in the current research is the development of a more accurate and economical diagnostic test for the detection of bone metastases. One approach is the analysis of bone formation and resorption markers, generated in processes of the bone metabolism [10,11,16,18]. Numerous studies analyze the influence of bone metastases of different tumors on bone formation and resorption markers. Jung et al. and Kamiya et al. find significantly elevated concentrations of different bone formation and resorption markers in case of bone metastases. The results of Halleen et al. , Lyubimova et al. , Chao et al. ,and Yao et al. show promising findings regarding the bone resorption marker TRACP 5b in the question of bone metastases. In our study, patients with RCC with bone metastases (median: 31.9) showed significantly (p=0.014) higher serum levels of TRACP 5b compared with patients without bone metastases (median: 8.7 U/L). Elevated TRACP 5b concentrations in blood samples indicated bone metastases with a sensitivity of 76.5% and a specificity of 36.7%. The area under the ROC-Curve was 0.68. Hence, our study indicates a significant correlation between elevated TRACP 5b concentrations and bone metastases in patients with RCC. Besides, our findings suggest that further analysis is required with regard to the TRACP 5b cutoff used for the diagnosis of bone metastases. For TRACP 5b concentrations obtained in our study, we identified the optimal cutoff value at 50.0 U/L in ROC analyses. After applying the cutoff of 50.0 U/L instead of the cutoff 5.0 U/L recommended by Salminen et al. , the quality parameters of the TRACP 5b analysis changed. Sensitivity decreased to 47.1% from 76.5%; however, the specificity increased considerably to 96.7% from 36.7%. Previous studies on TRACP 5b as a marker of bone metastases show that a different cutoff value may be applicable. Korpela et al. identifying their study on patients with breast cancer, the optimal TRACP 5b cutoff at 3.65 U/L by ROC analysis. Yao et al. determine in non-small cell lung cancer patients, the optimal TRACP 5b cutoff at 2.551 U/L by ROC analysis. These cutoff values are considerably lower than the cutoff that we identified. The optimal cutoff for TRACP 5b in the diagnosis of bone metastases does not appear to be established yet, and thus further research is required. Numerous studies confirm the relevance of TRACP 5b with regard to the diagnosis of bone metastases. Lyubimova et al. report that TRACP 5b detect bone metastases with a sensitivity of 82% and a specificity of 87% in patients with mammary carcinoma and with a sensitivity of 71% and a specificity of 83% in patients with prostate carcinoma . Likewise, a study by Korpela et al. illustrates in patients with mammary carcinoma significantly increased values of TRACP 5b in case of bone metastases. Their results show sensitivity of 87% and specificity of 62% . Yao et al. analyzed the diagnostic value of TRACP 5b for bone metastases in patients with non-small cell lung carcinoma. According to their data, patients with bone metastases show a highly significant elevation of TRACP 5b with a Sensitivity of 63.9% and a specificity of 76.8% . The results of a study conducted by Jung et al. on patients with RCC contradict the above reports. Their findings do not show a significant difference between TRACP 5b levels in patients with and without bone metastases. Moreover, in their study, patients with metastases other than bone exhibit higher elevated TRACP 5b values than patients with bone metastases . Our results do not confirm their findings because we found significantly elevated TRACP 5b levels in patients with RCC and bone metastases compared with patients with RCC without bone metastases. In conclusion, according to our results and despite existing controversy in the literature, the relevance of TRACP 5b assays for the diagnosis of bone metastases is evident. In conclusion, the results obtained in our study suggest that TRACP 5b is a valid biomarker of bone metastases in patients with RCC. TRACP 5b may be a potential screening tool or a follow-up marker in relation to bone metastases. Nevertheless, with sensitivity of 76.5% and specificity of 36.7%, we do not recommend this method as a replacement of conventional methods, i.e. bone scintigraphy for the detection of bone metastases. Studies on a larger scale, in a greater number of patients, and different cancer types are required to confirm the significance and potential of TRACP 5b as a marker of bone metastases in cancer patients. ©2014 Preussner R. This is an open-access article distributed under the terms of the Creative Commons Attribution License, which permits unrestricted use, distribution, and reproduction in any medium, provided the original author and source are credited. Department of Laboratory Medicine, Internal Medicine, Hospital of the Goethe University, Viktoriastrasse 50a, 64293 Darmstadt, Germany, Tel: 0049 / 1577 / 784 09 12.